As you might know if you have been an RF Cafe visitor for a while, my life-long hobby has been model aviation. Many notable people have similarly been aeromodelers from a young age, including aircraft designer Burt Rutan, Space Shuttle astronaut Robert "Hoot" Gibson, radio personality Paul Harvey, actor and WWII bomber pilot Jimmy Stewart, Olympiad Bruce Jenner, catamaran and surfboard designer Hobart "Hobie" Alter, to name a few. Physicist Dr. David (Dave) Wineland has just been added to the list since he won the Nobel Prize in Physics in December 2012 for his work on quantum computing. 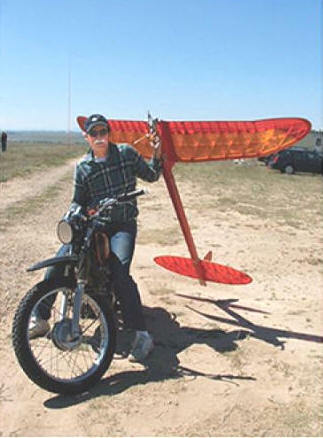 The Academy of Model Aeronautics' (AMA) monthly magazine Model Aviation printed an interview with Dr. Wineland in the January 2013 edition, where he discusses his history with model airplanes and his work at the National Institute of Standards and Technology (NIST) in Boulder, Colorado. Model Model Aviation editor Jay Smith granted permission for me to reprint the article here on RF Cafe since it will likely be of interest to engineers and scientists who visit the website. This article appeared in the January 2013 edition of Model Aviation, a publication of the Academy of Model Aviation (AMA). Thanks to Editor Jay Smith for permission to reprint it here. David Wineland, Ph.D is as humble and soft spoken as they come. A 68-year­old scientist with degrees from Cal­Berkeley and Harvard, his job title is Group Leader in the Time/Frequency Division at the National Institute of Standards (NIST), the so-called "atomic clock." He is a long-time AMA member and lover of model airplanes, and he just was announced as co-winner of the 2012 Nobel Prize in Physics, to bee awarded at a ceremony in Sweden on December 10, 2012. Don DeLoach spoke briefly with Dr. Wineland about model airplanes, quantum computing, and the mind-blowing attention he's received since being announced October 9, 2012, as a Nobel Laureate. DD: Do you remember your first model airplanes? How old were you? DW: Oh, I'm not sure. It was certainly before I was 10 years old, so the early 1950s I guess. I actually still have it, a scalelike solid display model from a StromBecKer kit. Here is Dave with his Satellite 1000 in 2006 in Denver. This is his original 1980 Nats winner in D Gas. The model is immaculate and is a consistent contest winner. Don DeLoach photo. A very young Dave Wineland. The year is 1954 and the place is Sacramento, CA. Photo provided by Dave Wineland. DW: California in the 1950s was an amazing place for kids who loved model airplanes. In those days, I'd ride my bike down to the schoolyard where there were always guys flying Control Line, so that was my first type of flying model. But there were Free Flight airplanes around, too, and I was always most interested in those. My family lived in Sacramento and there was a Free Flight field close to Mather AFB, off of Eagles Nest Road. That was the home field of the Capital Condors club. It was a 30-minute car ride so it took a bit of convincing to get my parents to drive me up there, but wow! Those guys really knew how to fly FF and I was entranced by them. DD: What other inspiring model airplane memories stick out from those days? DW: A quick story: As a kid I of course didn't know anything about flight trimming, but somehow got airplane in a thermal, and friends and I tried to chase it on bikes. The wind was pretty calm but the model flew so high it went out of sight. Miraculously, about an hour later, the mode landed a hundred yards from where it was launched. DD: When did you first join AMA? DW: I got back into model in the early 1970s, after graduate school. I was in Seattle then, as a postdoctoral researcher, and joined AMA about then. DD: Talk about your mentors. Or did you learn in a vacuum? DW: I pretty much learned on my own. In the neighborhood it was just us kids - I couldn't get my dad hooked. DD: Did you maintain contact with any of those old modeling friends? DW: Yes. One just sent me a note about the Nobel Prize last week. DD: Why are you into aeromodeling? DW: Well, this is hard to put into words. I guess it's just the emotion I feel when watching them fly. It rekindles a lot of magical memories from childhood. DW: Free Flight is so pure and challenging. I like the contrasts inherent in high-powered models - the speed of the climb followed by the slow-motion glide. DD: Talk about your club, the Magnificant Mountain Men. DW: by the early '70s I really wanted to do Free Flight again. I was hired at NIST, which was then called the national Bureau of Standards, and moved to Boulder, Colorado, in 1975. I knew about the Magnificent Mountain Men FF club and joined immediately after visiting the field. George Batiuk and Bill Gieskieng [both FF Hall of Fame members] were there. Dean Carpenter was a good friend with whom I hit it off right away. DD: What is your favorite model and why? DW: I like the looks of the Satellite the best. I never had the greatest success with it. It is harder to build and fly than some of the simpler designs, but it is this challenge that interests me. 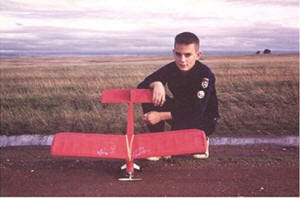 DD: What is your most significant accomplishment in aeromodeling? DW: Gosh, I don't know. I won FF Gas events at the AMA Nationals in 1980 and 1981, but it wouldn't have mattered if I had not won. What I enjoyed was being at the Nats with everyone else and sharing the same interest. That was fun. DD: To what/whom do you attribute your career success? DW: Well this is hard to single out. My dad was a civil engineer. Dad's work ethic certainly rubbed off on me. But it really hard to say. There were lots of good people in my corner over the years, so I was lucky. I had good support from my boss and my boss's bos. DD: Did you always know you were going to be a physicist? At what age did you know this? DW: I took physics class as a senior in high school. I thought, "Wow, this is cool!" and wanted to stick with it. I also enjoyed literature but thought I should pursue a career with more earning potential. DD: What message do you have for today's youth who want to pursue a career path similar to yours? DW: Model builders have a lot of the qualities that we need in experimental physics. One contrast we see with grad students is many are great with devices like computers, but most have not worked with their hands before. Model builders are naturals at this. A model-building background is perfect. When you build a wing on an airplane you have to build it to a certain strength or it will break. This is hard to teach except from practical experience. DD: Talk about your research bit. How far in the future is a quantum computer (QC), and what will it mean for mankind? DW: Don't invest in any quantum computing companies yet (laughs). On a serious note, we can make very small QCs now, but they are so small they are not really useful yet. But the technology is definitely coming along. Ina decade or so I feel optimistic that there will be a WC that will actually do something useful, or at least tell us something important. DD: What are the differences between quantum computing and classical computing? DW: In our lab at NIST we confine individual atomic ions, like a marble in a fish bowl. At the small scale, the marble (ion) rolls in a bowl. We have now learned how to put that ion in a "superposition" state., that is, it can be on both the right side and the left side of the bowl at the same time, which of course makes no sense in the ordinary day experience. Now, with classical computers (CC), like your laptop for example, the basic info is stored in a binary code, combinations of ones and zeroes. With quantum computers we can use small quantum states to represent the memory as ones and zeroes at the same time. With that kind of memory efficiency in QC we can store more information in three hundred quantum bits than we can with a classical computer made from all the matter in the universe. This is known as exponential scaling; it does not exist in the CC world. Now, we still need classical computers to run our tiny QC. But in the long term, a larger scale QC would be able to solve certain large problems that would be impossible in a CC. DD: How many other groups are working in your branch of quantum physics? DW: We are working on charge atoms. There are now about 35 groups around the world doing research similar to the work of our group. An there are five to 10 other physica lplatforms devote to this problem of qunatum computing. We at NIST are on one cog of a pretty big wheel. DD: You're 68. What does the future hold for you? Retirement? DW: Not sure but it won't be because I've lost my interest in science. I now deal with more administrative stuff than I'd like. And I wish I had more time for modeling! DW: Well, the Nobel Prize gets a huge amount of attention, which is amazing to me. Unfortunately, it focuses on a couple individuals. This is not representative of how science works because advances only come from the efforts of many people working on a common problem. The award could esaily have gone to some of my other colleagues. Note: I apologize for any errors that may have crept in as I typed in the text form the magazine hard copy.